Clare Curran resigned as a minister last week, but issues remain and look like continuing to receive attention. Re Claire Curran’s gmails … I think people are barking up the wrong legal tree. The question isn’t direct application of the OIA, but rather whether she complied with the Public Records Act 2005. Obligations under that legislation don’t end with her resignation. If she didn’t so comply, then the Chief Archivist can direct Curran to properly record emails that are “public records” … whereupon they will become “official information” that can be accessed. Now that Curran will no longer be subject to ministerial scrutiny at Question Time in Parliament, attention may switch to Jacinda Ardern and her handling of the Curran failures. The mess in the US is looking messier. The latest news claims that the ‘private memos’ of James Comey contained classified information, and Donald Trump Jr has been more closely linked to Russian interefrence in last year’s election. Comey testified last month before the Senate Intelligence Committee that he considered the memos to be personal documents and that he shared at least one of them with a friend. But his son Donald trump Jr has been linked more closely to Russian interference in the election. Mr. Goldstone’s message, as described to The New York Times by the three people, indicates that the Russian government was the source of the potentially damaging information. This is now under more investigation. Trump Jr has been defending himself via Twitter. On Monday, Donald Trump Jr. said on Twitter that it was hardly unusual to take information on an opponent. Both Putin and President Trump have tried to distance themselves. Back in Washington, both the White House and a spokesman for President Trump’s lawyer have taken pains to distance the president from the meeting, saying that he did he not attend it and that he learned about it only recently. So his sone, his son-in-law and and his campaign boss said nothing to him at the time? And have said nothing to him since, even though it has been a prominent ongoing topic? The president has denied any collusion with Russia over the election, but he looks like he could sink into the mire. 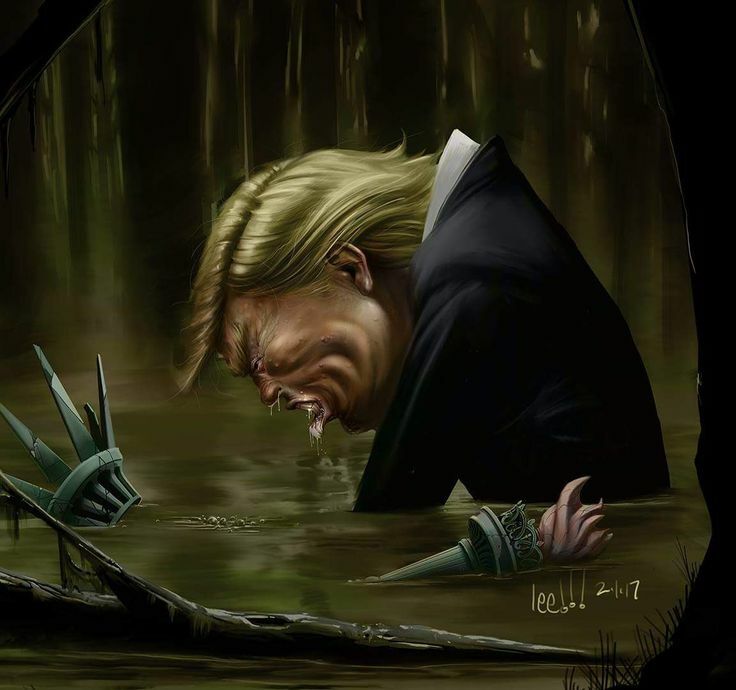 This draining the swamp thing may take a while yet. Especially when the Trumps look as murky as anyone else. Two articles of inter from last week on the US election – one saying that the consensus view of the CIA was that “Russia’s goal here was to favor one candidate over the other, to help Trump get elected”, and the other a detailed analysis of ’10 crucial decisions’ that affected the presidential election. During the campaign Trump said a number of times that a rigged election was a serious concern, but he doesn’t seem to think this is a big deal – see Trump: Claim of Russia Meddling “Ridiculous,” Dems Making Excuses. (With Kim Dotcom claiming that WikiLeaks may target next year’s New Zealand election this should be of some concern here). Looking back through the presidential campaign Glenn Thrush at Politico: 10 Crucial Decisions That Reshaped America – Nothing about the most dramatic campaign in memory was a foregone conclusion. The inside story of the pivotal choices that got us to President Trump. It should be remembered that the election was eventually decided by I think about 50,000 votes in three states, so it was very close. When deciding whether to contest the presidency Trump rated his chances at 10%. But, in the end, Brooklyn simply failed to predict the tidal wave that swamped Clinton—a pro-Trump uprising in rural and exurban white America that wasn’t reflected in the polls—and his candidate failed to generate enough enthusiasm to compensate with big turnouts in Detroit, Milwaukee and the Philadelphia suburbs. The second problem was more durable, utterly avoidable, entirely self-inflicted and ultimately damning: Clinton’s enemies were starting to weaponize the murky tale of her private email server, an issue that would do her permanent political damage, sap public trust and, eventually, hand Trump a winning issue. “It’s a cancer,” a longtime Clinton insider told meas her campaign was ramping up. “She’s her own worst enemy,” another said. This was symbolic of how obsessed media became with Trump coverage – in this case remarkable focussing on his absence rather than his presence. But if Trump’s time was, literally, money for the networks, the cable-Trump marriage was also unprecedented in a way that threw the political coverage dangerously out of balance. The absurdity of the situation was laid bare on March 3, 2016, when CNN, Fox and MSNBC prepared to air what was billed as Trump’s much-anticipated rebuttal to Mitt Romney’s claim that the GOP front-runner was a “phony” and a “fraud.” Trump was supposed to start talking at 1:30 p.m., but he was strategically, playfully late. The live shot of a flag-backed podium in Maine sat empty for five, 10, 15, eventually 30 minutes of Donald-free empty space that illustrated the vacuity of the celebrity-driven frenzy that defined Trump’s early campaign. CNN officials dismissed the incident, arguing that the image was just that—a static picture—that provided a backdrop for a stream of talking-head banter, much of it critical of Trump. For Trump, the point was clear: He was so much more important than any of his rivals that even his absence was more newsworthy than their presence, and the networks did nothing to dispel that view, airing his speeches in their entirety when no other candidate or even President Obama was afforded that privilege. The only two candidates who ever really had a real chance to stop him—golden boy hawk Marco Rubio of Florida and Tea Party icon Ted Cruz of Texas—made the calculation that ignoring Trump, and letting him run amok in the early debates, was their best chance at self-preservation. The decision by the two young senators—they are both just 45 years old today—may well go down as one of the most consequential wimp-outs in recent politics. But it seemed to make perfect sense in the summer of 2015, when Rubio’s Capitol Hill-based circle and Cruz’s Houston-based operation simultaneously decided on a hands-off-Donald approach. “Donald Trump: You’re asking Americans to trust you with their future. Let me ask you: Have you even read the United States Constitution?” said Khizr Khan, whose son, a Muslim-American Army captain, had died protecting his fellow soldiers from a suicide bombing in Iraq in 2004. Khan spoke, in a quavering monotone, about the injustice of Trump’s proposed Muslim immigration ban. By the time he pulled out a tiny dog-eared copy of the Constitution from his suit jacket pocket, the audience was on its feet, and reporters on press row were plucking out their ear buds to hear what he was saying. “I will gladly lend you my copy,” Khan told Trump, as his wife silently stood next to him, fighting back tears. Privately, Trump fumed about the Khan speech—he hated to absorb any insult without responding—even as the people around him, including Manafort, encouraged him to let it go. But there was, as always, no controlling Trump. This is a concern about Trump as president, especially internationally. Some think that Trump a ‘telling it like it is’ tough guy stance will allow the US to dominate countries like China, others dread what it could precipitate. The public hated it. A Fox News poll taken in the first week of August signaled to GOP leaders (wrongly, as it turned out) that Trump was cooked and could never recover: He dropped from running neck-and-neck with Clinton to 10 points down over the course of two weeks. “I thought that was it,” said one former Trump aide. Clinton’s team laughed off Trump’s nomination speech. Yet her pollster John Anzalone and his team were stunned to find out that dial groups of swing state voters monitored during the speech “spiked” the darker the GOP nominee got. So at this moment of Trump’s maximum vulnerability, Clinton was work-vacationing with the likes of Jon Bon Jovi, Paul McCartney and Jimmy Buffett in the manses of Long Island, Beverly Hills, Martha’s Vineyard and Silicon Valley. But Trump, surprisingly resilient and coachable when he needed to be, was to make masterful use of Clinton’s absence. 9. Trump goes scorched earth after Access Hollywood tape. October 7, 2016. One month before Election Day, Donald Trump was hit by a bombshell that would have spelled instant electoral death for anybody without his chutzpah (or even a human-apportioned sense of shame). On a Friday morning four weeks before the voting, the Washington Postobtained a hot-mic tape from a 2005 appearance on Access Hollywood in which Trump described in gross detail an incident in which he had sexually assaulted a woman who resisted his romantic entreaties. The fallout was swift, damaging and seemingly campaign-killing. The candidate’s daughter Ivanka, two people close to the family said, was mortified, and urged him to apologize immediately. Trump’s natural instinct—stoked by Bannon’s attack-when-attacked attitude—was to give as little ground as possible. One longtime adviser to Trump described the strategy this way: He couldn’t do anything about the tape—it was out there for everybody to hear—but he could stick with “his core brand” by reinforcing his refusal to play by the usual rules of politics. Trump came out of it seen as he wanted to be: a defiant candidate who flouted rules of “political correctness” and whose in-your-face candor consistently registered in polls as the perceived attribute voters liked most about him. And anyways, it was a classic Trump move: When you’re caught doing something indefensible don’t even try to defend it—attack. Trump, a guy who couldn’t seem to shut up, urged his surrogates to “go dark,” according to a former aide. Trump’s numbers collapsed again, but Bannon never doubted that his pal could pull it out and urged Trump to indulge his most brazen showman’s impulses by turning damning on-tape proof that he was a sexual harasser into a populist crusade against the “rigged system. 10. Jim Comey sends a letter to Congress. October 28, 2016. Clinton wanted to run her campaign her own way. To the frustration of her staff, that often entailed less retail campaigning: She insisted more often than not on flying back to her house in Chappaqua on most days, and held her debate prep sessions at a nearby conference center instead of doing them on-the-fly in battleground states, so she could combine cramming and campaigning. That hesitation about “the campaigning part” was why, despite their confidence Clinton would pull out a win, many in her camp came to see the campaign as a high-stakes game of musical chairs: The candidate who had the worst final news cycle would probably lose. On a sleepy Friday afternoon 10 days before the election, FBI Director James Comey sent a letter informing Congress that he had obtained a big new batch of emails pertaining to Clinton’s email server. It was a revelation widely (and inaccurately) cast as his decision to “reopen” the case, after having announced in early July that Clinton had been cleared of wrongdoing but had been reckless in setting up her private email server. Top officials for both campaigns said the revelation—which turned out to be an inconsequential cache of previously parsed emails kept on the laptop of Clinton aide Huma Abedin’s estranged husband, Anthony Weiner—was a game-changer in a race in which Clinton had little margin for error. A campaign that was notable for Trump doing everything not by the book which kept shocking many, and for Clinton’s flawed candidacy and flawed campaign, two of the biggest deciding factors turned out to be Russian and FBI involvement. It’s nothing new that Russia and the US interfere in elections of other countries but the extent Russia has allegedly done this in the US to this degree is unprecedented. The way hacked emails have been used should be a concern around the world. It’s not new – hacked emails and other communications featured in Nicky Hager’s ‘Dirty Politics’ book launched early in New Zealand’s 2014 general election, as it turned out unsuccessfully. But I suspect that how that was done will have been noted and learned from. WikiLeaks tried a different approach in the US election, drip feeding emails over a period of time. This certainly had an impact. Ultimately FBI head James Comey’s interference probably swung the election in Trump’s favour at a crucial time, but that situation was set up and enabled by the hacking and the drip feeding. Democracy is at real risk of being trashed by hacking. Politico reports that Julian Assange has denied trying to influence the outcome of the US election. The email jar must be just about empty, and crumbs are all over Assanges face. Plus jam. Plus egg. WikiLeaks founder Julian Assange on Tuesday defended the group’s decision to post troves of Democratic documents during the height of the election season, saying a moral imperative drove them to do so. There may be public interest in illegally hacked emails. But drip feeding them throughout the last months of the US campaign is clearly aimed at influencing the election, and using the election to get attention. If it was important enough and justified to make emails public they would have been made public when they were available, not drip fed through the campaign. Assange and Wikileaks have lost a lot of credibility and support through this exercise. He has made himself no better than his target, Hillary Clinton, and no better than the person he may enable, Donald Trump. If Trump wins I expect a lot more disappointment will be directed at Assange in particular. Power corrupts, and WikiLeaks has been absolutely been corrupted in trying to manipulate the US election. FIB head James Comey sprung another surprise on the US election, saying that after checking emails they wouldn’t change their earlier stance that they would take no action against Hillary Clinton. “Based on our review, we have not changed our conclusions that we expressed in July,” Comey in the new letter to congressional committee chairmen. We went through this as fast as we could,” a senior law enforcement official told CNN, with another law enforcement official saying investigators worked “around the clock” to review the large volume of emails. The FBI found the new emails as part of its separate investigation into a sexting incident by Anthony Weiner, the estranged husband of top Clinton aide Huma Abedin. The thousands of new emails were mostly personal and duplicates of what had already been seen, law enforcement officials said in explaining how the conclusion was reached so quickly. The laptop which was found was about a decade old with lots of personal content on it not relevant to the investigation, according to one source. The probe is considered over with regard to Clinton. The Clinton camp is praising Comey now, and Trump is back to saying the election is rigged. About 20 million votes have been cast since the first announcement. It’s difficult to know how much the swings will affect the final result, but with Clinton still ahead by 2-3% in most polls this will help give her a final nudge. Newsweek has details – HERE’S WHAT THE FBI FOUND IN THE EMAILS ON ANTHONY WEINER’S LAPTOP (nothing incriminating Clinton). It’s too late for this to show up in polls before the election so the result of the mess will have to wait until results start to become known on Wednesday (New Zealand time). Donald Trump has put out this statement on the FBI bombshell of bugger all. Trump is making things up, again. The FBI stated “cannot yet assess whether or not this material may be significant”. So Trump is making claims he cannot substantiate. Trump has got away with making false and unsubstantiated claims and accusations through his campaign, to the extent that he still could get elected President of the United States. If he then continued with his habits of frequent fabricating and lying, and kept attacking the media, and follows through with threats of restricting the media, is that going to be worse than a President Clinton with a record of inappropriate and possibly illegal use of emails? Clinton appears to have ignored good advice about her use of emails. Trump has ignored a lot of advice in his campaign. A letter from FBI director James Comey ignited a new fire storm in the US presidential campaign, but it actually said very little, especially about Hillary Clinton. The FBI, in other words, is not reexamining its previous findings. It is not questioning its previous legal conclusion that “no reasonable prosecutor” could determine that charges are warranted. Based on the letter, it appears that the FBI will simply provide the same scrutiny to these newly uncovered emails as it previously applied to the emails it already reviewed when it determined that criminal charges are not warranted. It would be remarkable if the US presidential election swung on this letter. It would appear that at the very least it has handed an enhanced weapon to Donald Trump’s campaign. As if the US election hadn’t been bizarre enough, it has just been announced that the FBI is going to have another look at Hillary Clinton’s use of emails. The move comes after Comey and the Justice Department decided in July not to pursue charges over Clinton’s email practices. Comey has since come under criticism from lawmakers and others who claim the investigation downplayed the mishandling of classified information during Clinton’s tenure. The presidential campaign has been dominated by Clinton’s use of emails and Donald Trump’s alleged abuse of women. Whoever wins in two weeks the controversies and potentially legal actions are likely to linger, possible for years. There have been reports that if Clinton wins and the Republicans keep control of the House there will be a barrage of ‘Oversight’ investigations. As David Weigel of The Washington Post reported on Wednesday, the chair of the House Oversight Committee, Jason Chaffetz, is planning on “spending years, come January, probing the record of a President Hillary Clinton.” Republicans will start by continuing to investigate everything she did when she was secretary of state, and just keep on going with whatever ghastly crimes she commits as president. Welcome back to the 1990s. Of course, the Oversight Committee’s job is oversight. And Rep. Chaffetz is much smarter than the person who preceded him in that position, Darrell Issa; Issa’s probes of the Obama administration were far more likely to end with Issa looking foolish than with the administration being embarrassed, and Chaffetz is unlikely to commit as many pratfalls. But it’s a hint that Republicans are in no mood for a “honeymoon” with the new president, where everyone says they hope they can get along and make important progress for the good of the country. It’ll be open warfare from Day 1. That’s dependent on Republicans retaining control of the House, which they will probably do. As long as they have the chairmen’s gavels, they can mount whatever investigations they want and drown the administration in subpoenas. And look, oversight is important. It can be done in a responsible way that ferrets out wrongdoing and keeps the administration honest. But how much confidence should we have that Republican lawmakers are capable of that? To answer that question, all you have to do is look at what the last eight years have been like. It isn’t encouraging. Take Benghazi, about which many Republicans are still livid. There were eight separate congressional investigations into the attack that killed four Americans. Clinton’s emails will eventually get just as vigorous an examination, with the fact that she has not yet been placed in leg irons spurring every new hearing. Unfortunately for Republicans, this will be exactly what their base demands. After all, you can’t go through an election in which your presidential nominee leads daily chants of “Lock her up! Lock her up!” and then think all that rage will just disappear. The next White House tenure could be ongoing ugly. Or uglier. Federal law enforcement officials said Friday that the new emails uncovered in the closed investigation into Hillary Clinton’s use of a private email server were discovered after the F.B.I. seized electronic devices belonging to Huma Abedin, a top aide to Mrs. Clinton, and her husband, Anthony Weiner. So the new information may not be significant but the FBI is dropping it into the closing stages of the campaign, without any indication details will be released prior to election day? So the Democrats are a mess, the Republicans are a mess, the FBI is a mess. And the US has been seriously divided. WikiLeaks continues to drip feed emails into the US presidential campaign. Another day, another batch of WikiLeaks emails – this time, showing the 2008 Hillary Clinton campaign’s efforts to test then-Sen. Barack Obama’s potential vulnerabilities, including on deeply personal matters like his father’s Muslim faith and his own past cocaine use. WikiLeaks say they will keep leaking ‘daily’ but this is a continuation of stuff that is not getting the attention of the Trump sexual assault stories. It’s mostly very dry and convoluted, and is failing to make many headlines. Often of more interest is why WikiLeaks is effectively campaigning against Clinton. From the UK Guardian: From liberal beacon to a prop for Trump: what has happened to WikiLeaks? The seeming alliance between Trump and WikiLeaks is an astonishing role reversal. In 2010 it was lauded by transparency campaigners for releasing, in cooperation with publications including the Guardian, more than a quarter of a million classified cables from US embassies around the world. WikiLeaks founder Julian Assange became a hero to many. At the time, Republican politicians expressed outrage at WikiLeaks, but now some are seizing on its revelations as potential salvation for Trump’s ailing candidacy. Conversely, liberal activists have expressed dismay at the hack of Clinton campaign chairman John Podesta’s email account and the calculated timing of the release. Last week US intelligence officials blamed Russia for previous hacks. It is not yet known whether Podesta’s emails were hacked by the Russians, but US officials say the attack fits the same pattern. Russian president Vladimir Putin has denied the allegation. All of which raises the question: do Assange, Putin and Trump form a triangle? Are they in communication with each other or merely exploiting a coincidence of interests? Some observers argue that Assange’s war on Clinton is personal: she was secretary of state at the time of the diplomatic cables leak. Her perceived secrecy and hawkish foreign policy represents the antithesis of his anti-US imperialist worldview. The capricious, nihilistic, non-ideological Trump might seem like a kindred spirit by comparison. So far WikiLeak’s campaign against Clinton has been largely ineffectual. If the Republicans had chosen a safer traditional type candidate they could have chugged away and let Wikileaks damage Clinton. But they have Trump, who has used the media adeptly to get the nomination, but that has now turned dramatically against him.